Located in the vibrant Bull St precinct in Bendigo, Cafe Essence offers a wide range of gluten free selections, including bread, all freshly prepared on the premises. With about 80% of the menu being gluten free, choose from biscuits, cakes, sandwiches, toasted sandwiches, soups, or the very popular all day hearty cooked breakfasts. Even the stock, sauces, relishes and dressings are made at this Bendigo cafe. With an emphasis on freshness and healthy choices, the cafe's foods are largely preservative free. 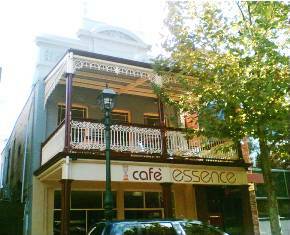 Cafe Essence also provides catering for private and business functions in and around Bendigo. Enquiries are welcome. Gluten free wedding cakes are made-to-order. Please allow plenty of notice and phone to discuss your requirements.